As much as I love the latest fad trend, it’s also nice to add something more unique and individual into your home to mix up your style. Shopping online and on the high street can get pretty repetitive and samey if you don’t know where to look for newness, so it was so refreshing to be introduced to a brand I’d never heard of. Today I want to introduce to you Sarah Boddy. Sarah has created a range of unique homeware from her own drawings, drawing inspiration on her Leicestershire country life surroundings, including her own flock of chickens. The range includes stationary, homeware essentials and even wall art inspired by the same collection of country animals which have been beautifully hand sketched. The homeware collection includes oven gloves, aprons, tea towels, placemats, glass coasters, chopping boards, egg cups, glass worktop savers and cute teapots all designed with one of Sarah's trademark sketches. My favourite sketch in the collection is the flamingo range. I've got the flamingo glass worktop saver which I keep on show over my oven when its not in use and it acts as a little piece of art in my kitchen, but I also love the bee collection . Now I’m guessing there aren’t many flamingos in Leicester but I blooming love a flamingo so this print definitely caught my eye since I love anything kitsch. The prices at Sarah Boddy are certainly affordable; egg cups at £7, mugs at £11 and glass work top savers at £24. The perfect prices for gifting. It's a great website to grab some gifts for that friend who loves something a bit quirky. 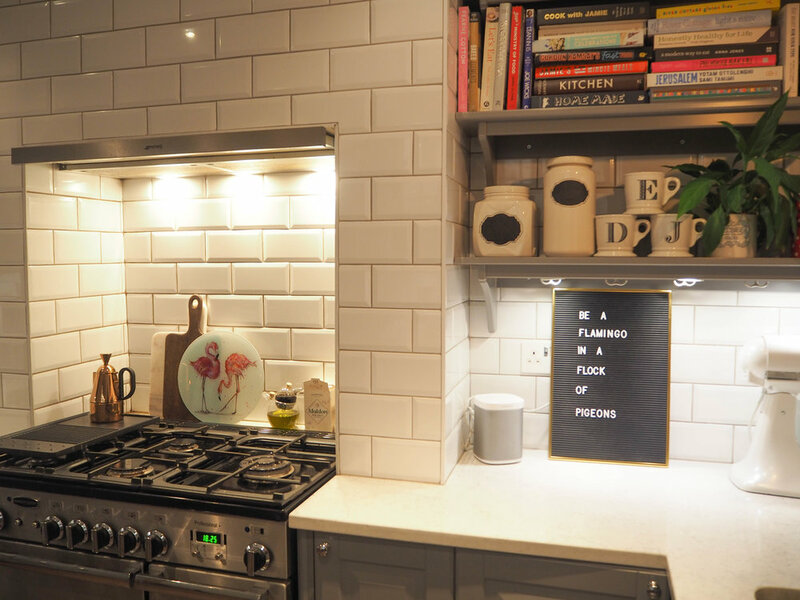 I love that Sarah's designs are timeless and will fit with any kitchen style – not just your typical country/ shaker, although they would look pretty gorgeous in a country kitchen above an aga, I also think they work well in industrial kitchens like mine. Here are my six top pics from Sarah Boddy. (Including my flamingo worktop saver). This sponsored post was in conjunction with the lovely people at Sarah Boddy. I would never consider promoting a product that I didn't love and wouldn't have in my own home.